My husband and I were trying to figure out where to have dinner one Friday night and we ruled out place after place because they were too crowded. After awhile, we realized maybe it wasn’t a good strategy to go out to eat somewhere that didn’t have a lot of people on a Friday night. Even though we had a reservation at the Wild Plum Tea Room, we still had to wait close to an hour. 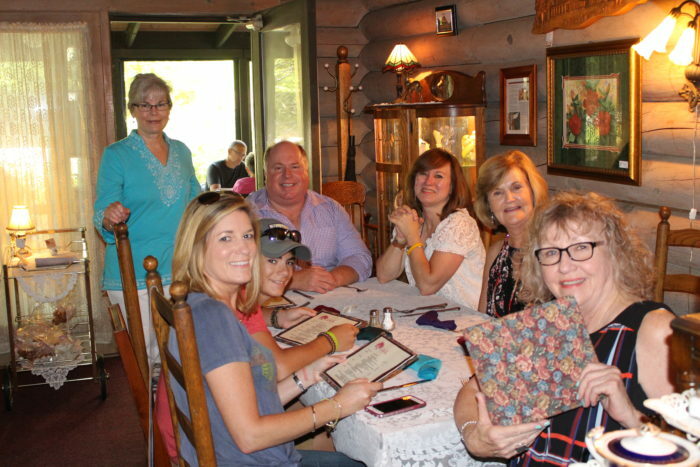 Luckily, I was with a great group on our visit to Gatlinburg, TN and the weather was nice so we sat outside on the porch and had a good time hanging out. There was quite a crowd for a late Saturday afternoon lunch. The crowd was an indication of the quality of the restaurant, and as it turns out, it was worth the wait. 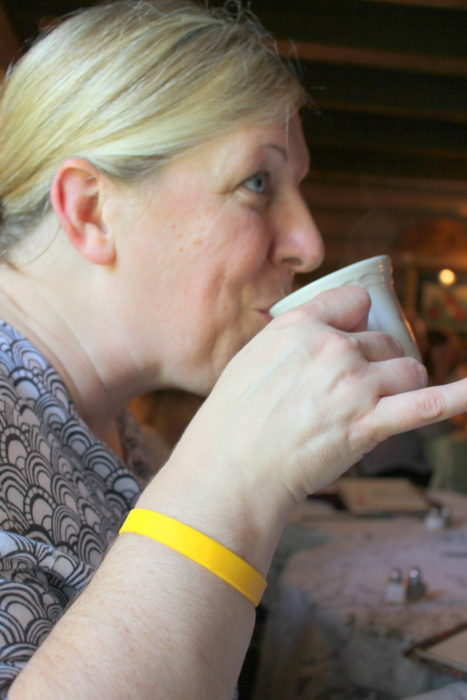 Surprisingly, there was just one tea option – the Wild Plum Tea. You know I’m used to most tea rooms having a long list of teas on their menu to choose from. 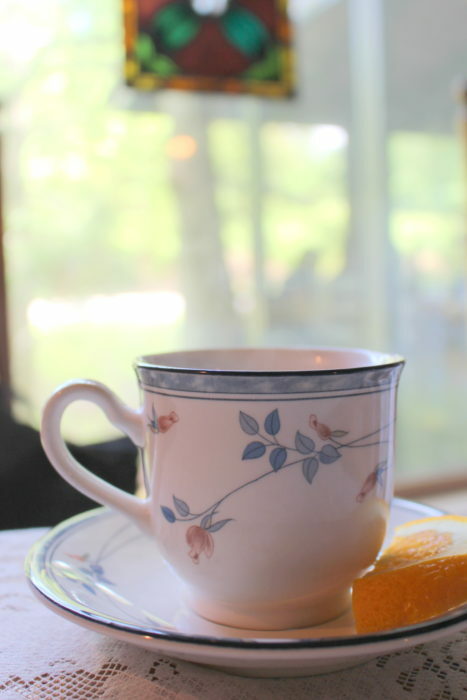 Again, it turned out to be a good thing because the tea was delightful! Their house tea is a sweet, citrus, fruity black tea and I believe there might have been a touch of cinnamon. It’s a great choice whether served hot or cold. 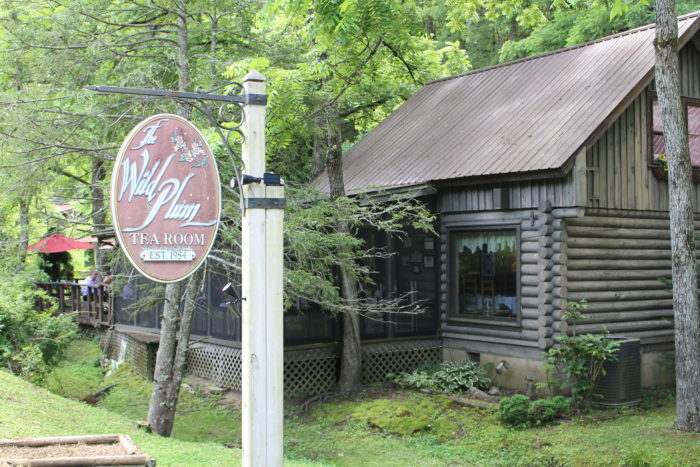 The Wild Plum Tea Room prides itself on making everything from scratch using the freshest possible ingredients. And we could tell. We started with the complimentary plum walnut mini muffins with a cornbread-like crusty crunch accompanied by a dollop of clear plum jelly. The jelly was another surprise. 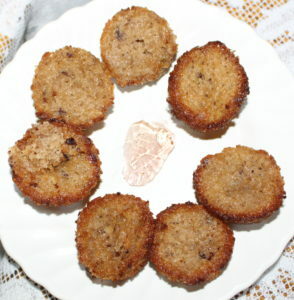 It was full of fruity, slightly floral flavor and was quite a tasty topping on the muffins. 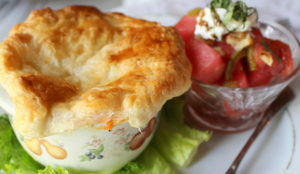 I had the lobster pie with watermelon salad. 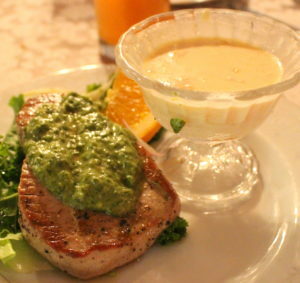 This is one of their signature dishes that is consistently offered across their seasonal menus. It had large chunks of Maine lobster in an artichoke cream sauce topped with puff pastry. The watermelon was a lighter complement to a small but weighty dish of comfort food. I would order this again in a heartbeat. 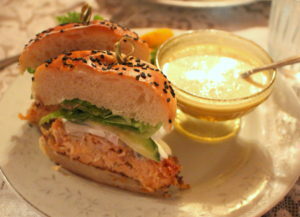 Another dish they are famous for is their salmon burger served here with a side of lobster bisque. 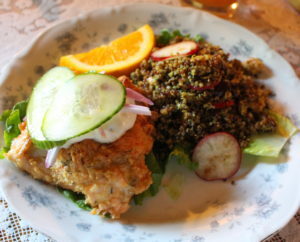 Fried chicken with quinoa salad. Doesn’t it look good? Pork chops with the soup of the day. 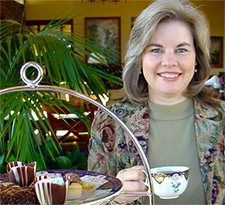 The tea room is modeled after tea houses in Austria. 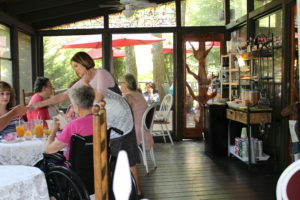 It’s on the 8 mile Arts & Crafts trail in Gatlinburg, TN located at 555 Buckhorn Road. 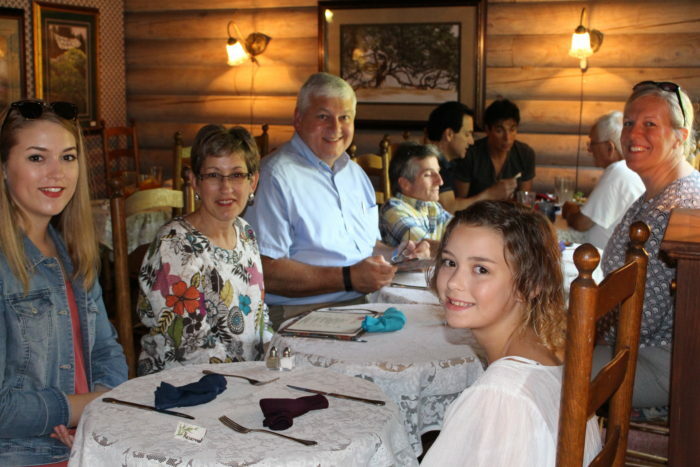 I recommend you call ahead at (865) 436-3808 for reservations at least 24 hours in advance. I’m sure it’s helpful for the kitchen to know how many to expect since they make their food from scratch. Note that they do not take same day reservations. A reservation is not necessary it’s just that they will seat those with reservations first. 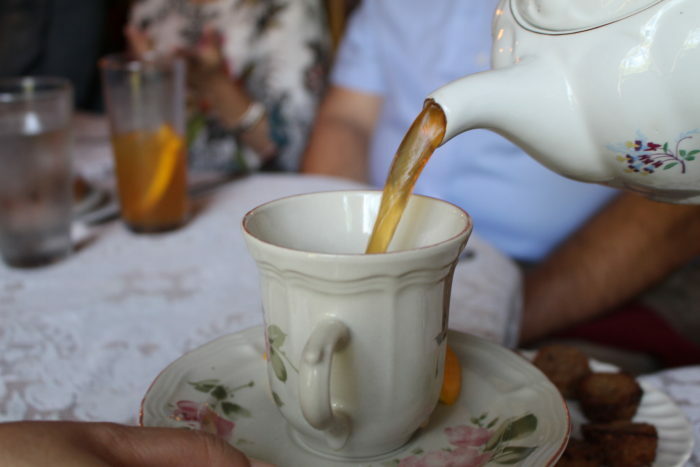 Set aside a good bit of time, at least a couple of hours, to really relax and enjoy the whole experience of tantalizing cuisine, good tea, and most of all good friends.